Polish pottery makes a perfect gift for a newlywed couple or someone celebrating an anniversary or birthday. Each hand-made piece makes a perfect addition to any home. The colors and designs often complement each other making it easy for pottery lovers to mix and match to create their own personal displays of these beautiful and practical art pieces. Polish pottery allows you to express your own artistic taste in your own home. The hand-made artistry of Polish pottery makes a beautiful and unique gift for a wedding or anniversary! Visit our shop in unique Monticello, Illinois today to find a truly unique gift. People who visit our shop are very impressed with the selection of patterns and variety of pieces that we carry. Let us give you the personal service you deserve when making a purchase of lasting quality and beauty. If you are unable to visit us in Monticello and would still like to order, we do provide complimentary gift registry wrapping, and can ship your purchase at standard USPS Priority Mail rates. Invite your friends and family to shop at Out of the Blue for your wedding gifts. Every new couple should have a piece of Polish pottery bake ware and tableware to treasure for a lifetime. We can help you select your table settings and bake ware to complement your new home. 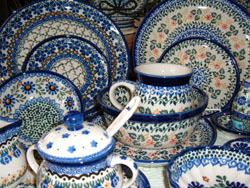 Each piece of Polish pottery is microwave, oven and dishwasher safe.